Accomplished Israeli historian Anita Shapira recounts the apocryphal anecdote in David Ben-Gurion, Father of Modern Israel (Yale University Press). 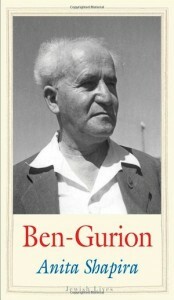 Shapira, whose book Israel: A History won the National Jewish Book Award in 2012, presents Ben-Gurion as the person who did more than anyone else to establish the state. He inspired a nation of idealists and wartorn refugees to achieve the impossible. But does your overcrowded bookshelf need another Ben-Gurion biography? I can think of three strong reasons to recommend Shapira’s book. Although not the definitive biography, Shapira offers a fresh perspective on Ben-Gurion’s life based on newly available files of the Israel Defence Forces and extensive work in the archives at kibbutz Sde Boker, where Ben-Gurion lived. She sets out his considerable accomplishments through colorful anecdotes and well-crafted prose. As well, despite the passage of years, Ben-Gurion remains a central figure in contemporary debates, a touchstone for politicians from all parties. He is invariably quoted during heated arguments over Israel’s relations with Germany, its borders with its neighbors and its treatment of the Palestinians. He is often cited for his work in forging a partnership with the religious communities in the 1930s. Shapira offers solid scholarship for those who wish to reflect on his work. And, for those with big ambitions, the new biography offers a vivid portrayal of how he scaled the heights of domestic and international politics. 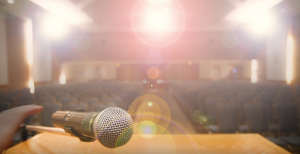 His biography may not be a roadmap to glory but aspiring leaders could pick up a few tips. Shapira writes in detail about the years after the state was declared in 1948, and especially about Ben-Gurion’s role leading up to the Sinai campaign. However, the most engrossing part of this book is about his unlikely development as a leader. With a knack for telling stories, Shapira effectively tracks how the unexceptional youngster, not particularly well liked by his peers, developed pragmatic organizational skills, sharp elbows and incisive political instincts that propelled him into the forefront of the Zionist movement. Ben-Gurion, born in 1886, grew up in Plonsk, a backwater shtetl three hours outside of Warsaw. Shapira found nothing in his birthplace, his lineage or his education that hinted at his future role in history. She sees no notable qualities in his personality that foreshadowed his destiny. His mother died in childbirth when Ben-Gurion was 11. He quit school after his bar mitzvah, although he had a lifelong love of learning. By 14 years old, he had embraced the Zionism of his father, who had been swept up in Theodor Herzl’s dream of a Jewish homeland in Palestine. However, Ben-Gurion was not in a rush to make aliya. At 18, he moved to Warsaw with the intention of becoming an engineer. The engineering schools rejected his applications. Here is where destiny steps in. He happened to be in the city at a crucial moment in history. He was swept up in the heady events of the days before the Russian Revolution. He joined Poalei Zion (Workers of Zion), a party that combined his newfound enthusiasm for Marxist socialism with Zionism. Although his grasp of Marxism was considered shallow, he rose to a leadership position, recognized as a strong debater and speaker. He finally immigrated to Palestine in 1906, but his early years in Palestine were not particularly auspicious. He often said one thing and did another. He firmly believed that Jews would reclaim Palestine only by working the land. He said the land would belong to the Jews only when the majority of its workers and guards were Jewish. He worked in the fields at Petach Tikva and then in the Galilee but he was frequently sick and, when he was healthy enough to work, he was miserable, Shapira writes. Throughout the following decades, he described himself as an agricultural worker while, in reality, he was doing other work in and outside of Palestine. He had a strained relationship with his father and, according to Shapira, a distant relationship with his wife, who was the mother of his three children. He was excluded from clandestine groups and collectives in Palestine that were forming in those years. Also, he misunderstood political realities. He was convinced that the Turks would remain in control of Palestine, never anticipating the British Mandate. Ben-Gurion’s rise to prominence began slowly after the First World War. He expanded the Histadrut, the national federation of trade unions, into one of the most powerful institutions in the country. Elected leader of the World Zionist Organization and the Jewish Agency in 1935, he became the recognized leader of the Jewish community in Palestine. By the mid-1940s, he was exactly the type of leader that was required for the state of Israel to be born. Shapira shows that, from these ambiguous beginnings, a giant of history was formed. The book has little to say about the lasting significance of some of his initiatives. She writes about his authorization of the forced expulsion of some Arabs, his reluctance to define Israel’s borders and, despite his secular lifestyle, his partnership with the religious community, but does not mention the social and political tensions arising from these initiatives. Shapira does not hold him accountable for creating conditions that led, although unintentionally, to many of the difficulties now confronting the country. Regardless, Ben-Gurion’s accomplishments overshadow everything else. He transformed armed militias that were focused on fighting the British into a military force that could stand up to the armies of neighboring Arab countries. He ensured that tanks, artillery and aircraft were available to defend the land and its people. He hammered together a provisional government from the fiercely competing factions among the Jewish people in Palestine. In sharp contrast to prominent Zionists of his era, Ben-Gurion advocated for a Zionism of practical achievements and put little faith in diplomacy and international proclamations. He demanded that Hebrew names be given to every aspect of government-related activity. He ensured that the religious community became partners in this ambitious nation-building project. He also had a hand in shaping the cultural, religious and intellectual character of the new country right from the start. Shapira says that Ben-Gurion liked to argue that history was made by the masses, not individuals. She shows that, beyond a doubt, his role was decisive.